Think you know everything about the Biomat®? The internet is a vast world of truths and misinformation. Check out our Biomat® Myths Debunked section by clicking here! What makes the Biomat® so special? A product as groundbreaking as the Biomat® is destined to attract imitators. Check out our thorough investigation of imitation Biomats® by clicking here! Every day, our bodies and minds are subjected to stress. This results in aches and pains, irritability and fatigue. Since 1997, the Biomat® has helped thousands of those suffering from minor muscle and joint pain all the way to arthritis. How does the Biomat® work? Unlike an electric blanket which uses electric coils to create heat, the Biomat® uses a combination of fabrics and amethyst stones to generate far infrared rays which is then transferred to the body as heat. The heat comes from friction generated within the body through the effects of far infrared rays. Far infrared rays warm the inside of your body and the part of your body making contact with the Biomat®. Should the temperature of any part of the Biomat® exceed the set temperature, the thermal sensors distributed throughout the Biomat® will cut off the electric current. 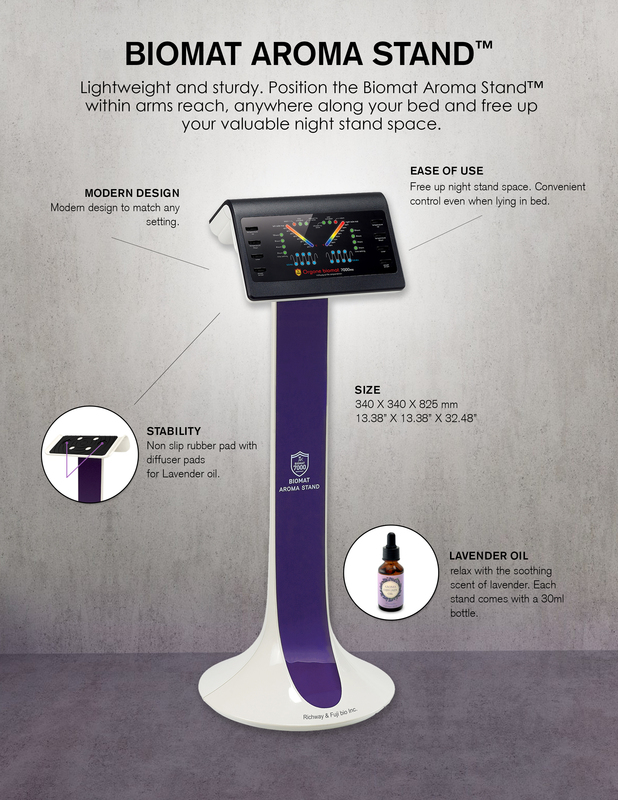 When the Biomat® reaches the selected temperature, the E.D.N.I. lights will come on and will stay on until the Biomat® needs to raise the temperature. The Biomat® comes with an external control box which allows you to adjust the desired temperature and usage time (between 2, 4, 8, or 12 hours). As an added safety feature, when the controller is set to 131°F or higher, it will automatically step down to 113°F after 4 hours. Negative ions, or anions, are atoms that have a greater number of electrons (-) than protons (+), which result in a negative charge. They are abundant in natural environments such as forests, mountains, waterfalls and oceans. Negative ions are believed to relieve stress and boost our energy. Studies have indicated that during thermotherapy, or hyperthermia, the body is exposed to higher temperatures which causes a significant increase in skin micro-circulation, skin temperature and core temperature. Athletes, carpenters, construction workers, or anyone that has a physically demanding job. The Biomat® is a registered FDA medical device making it suitable for use in hospitals and therapeutic clinics. It is easy to use and safe to operate. 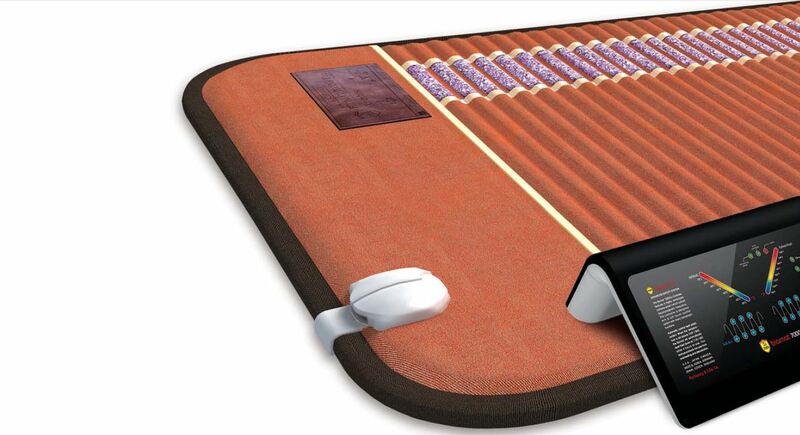 Get pain relief at home and whenever you need it by owning a Biomat®! Do you suffer from arthritis pain? The Biomat® can help! Negative ions - Our Biomat's® TOCA™ layer is made up of natural tourmaline. EMF - Special layers of fabric in conjunction with the Biomat® EMF Interceptor effectively reduces electromagnetic waves. Five different sizes to choose from! The perfect compliment to any Biomat® Professional and larger! Also compatible with the Orgone Biomat®! WARNING: Use carefully. May cause serious burns. Do not use over sensitive skin areas or in the presence of poor circulation. The unattended use of the Biomat® by children or incapacitated persons may be dangerous. Click here for additional Biomat® safety precautions. *Specific medical advice should be obtained from a licensed health care practitioner.